Each panel above is made from two separate puzzles of the tiger and dragon listed separately below. Although traditional rivals, these two share roles in Chinese mythology as protector gods - the white tiger in the west and the blue dragon in the east. 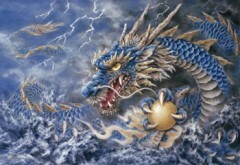 Mark Schumacher has lots more details on his page on Ssu Ling (the Chinese name for the four protector gods). This puzzle has smaller pieces than the standard size. Traditional rivals, tiger and dragon face off under a full moon masked only by a sprig of cherry blossom. The four gods, the white tiger and blue dragon to west and east, Genbu the entwined snake/turtle to the north, and a splendidly flamboyant Suzaku (the red bird) occupying the foreground. All this in Kayomi's distinctive warm tones making a rich and impressive picture. This puzzle has TINY pieces! A simple but effective composition: the owl approaches us ready to pounce. The cherry blossom lit only by the full moon has an eerie tone, which will make the puzzle interesting but quite a challenge. This is a glow-in-the-dark puzzle. An owl with young, in a pretty sylvan setting. 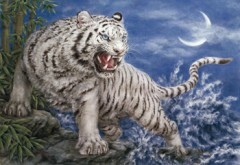 The white tiger, protector god of the west, looking suitably fierce, yet in Kayomi's characteristically soft style. The box includes the characters for 'West: white tiger', and the Chinese reading Bai-hu for "White tiger." 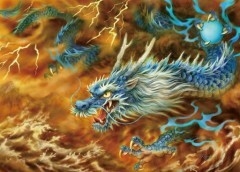 The blue dragon, protector god of the east, shows his teeth, while his long long tail writhes into the distance among the lightning strikes. He has, of course, his cintamani magic ball at the ready. The box includes the characters for 'East: blue dragon', and the Chinese reading 'Qing-long' for "Blue dragon." 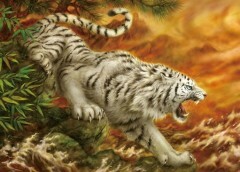 The white tiger, protector god of the west, looking suitably fierce, yet in Kayomi's characteristically soft style. The box includes the characters for 'West: white tiger', and the Chinese reading 'Bai-hu' for "White tiger." A pair of dragons make fearsome adversaries. But in Buddhist-inspired mythology, they are not seen as evil, rather as symbols of right. Here each dragon has one claw extended as if to fight, but in the other holds the wish-fulfilling jewel, or cintamani (in Sanskrit), of both Buddhist and Hindu tradition. A huddle of kittens — the title says it all! Mother and child, a sweet pair of bright-eyed owls. No biographical details available. She signs her given name Kayomi in Roman letters. Her style is quite distinctive - soft and fluffy - and perhaps her work is done with pastels, though it is difficult to tell from just a print. For reference: you can view all of her puzzles that are out of print in the Attic.